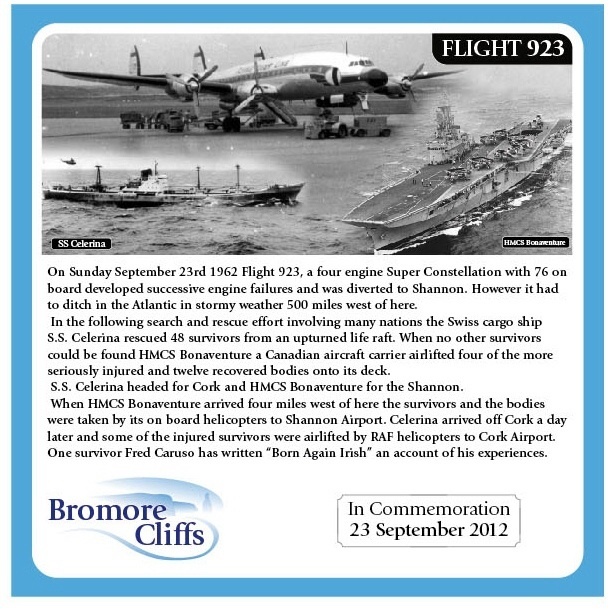 It was in late September 1962, that five-year old Michael Flahive from Ballybunion stood on the Bromore Cliffs and stared in amazement at a giant aircraft carrier dropping anchor in the Shannon estuary. Young Michael had no idea that he was witnessing the closing stages of an incredible series of events that began with a plane crashing into the Atlantic, followed by amazing tales of survival, acts of heroism and a dramatic rescue mission. On board that aircraft carrier – the HMCS Bonaventure - were some of the 48 survivors and recovered bodies of one of the worst air disasters in peace-time. On the morning of the 23rd of September, on the other side of the Atlantic ocean, Flight 923 took off at 8 a.m. from McGuire air base and headed for Gandar air field in Canada. Here, the plane refuelled and continued on its scheduled flight to Frankfurt, Germany. On board the four-engined Lockheed Super Constellation were 76 passengers and crew. The passengers included a company of soldiers who were on their way to a tour of duty in post-war Germany. Everything was fine until about two hours into the flight, when the plane ran into a severe hail-storm and heavy winds. Shortly afterwards, passengers noted that one of the starboard engines was on fire, but the crew managed to quickly shut it down. The captain diverted course and headed for Shannon airport, while reassuring everyone that the plane was designed to fly on two engines. Some time later a port engine failed, and this stirred the cabin crew into action. For the next 90 minutes the flight attendents went through emergency 'ditching' procedures with the passengers. With the plane losing altitude and a third engine failure, the captain sent out a distress call and decided to do a 'controlled' ditch into the ocean, just 500 miles west of ireland. Instead of the text-book 'ditch' however (where the plane should glide to a smooth halt), the Constellation smashed into the huge Atlantic waves with such force that seats were uprooted and people thrown forward towards the front of the fuselage. Amid panic, chaos, confusion and many acts of selfless heroism, most of the passengers managed to evacuate and swim towards the five life-rafts that were deployed by the flight crew. However, only one of the rafts was accessible, the rest having drifted away in the huge ocean swell. To make matters worse, this life-raft had deployed in an upside-down position. Designed to carry 25 people, the raft managed to stay afloat with 51 survivors inside, and for six hours they bailed water and stayed positive in the freezing Atlantic, surrounded by 40-foot white-capped waves whipped up by gale-force winds. Their spirits were kept up with the sound of an aircraft circling overhead. This aircraft was an Air Force C-118 military transport plane, going from Scotland to Newfoundland. The pilot had responded to Flight 923's distress call, and eventually spotted the raft after circling the area for some time. He then dropped red location flares to help in the rescue mission. In the meantime help was on the way in the form of a Swiss freighter ship, the S.S. Celerina, whose radio operator had also picked up Flight 923's distress call. Once it reached the crash site, the S.S. Celerina's crew threw rope ladders over the side and helped the frozen and exhausted survivors to safety, an operation made even more difficult by the 20-foot waves pounding into the ship. Among the survivors was a doctor (Fred Caruso) who, in spite of his own injuries, administered first aid tirelessly to the others, and undoubtedly saved the lives of many. 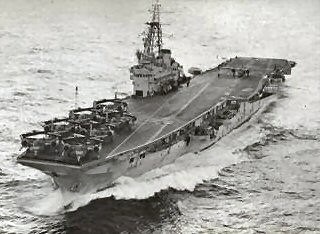 More help arrived when the Canadian aircraft carrier HMCS Bonaventure reached the crash scene at mid-day on the 24th of September. This ship carried the much-needed supplies and medical staff to help the wounded, and used its helicopters to ferry supplies and personnel to the Celerina all afternoon. The Bonaventure took onboard four of the most seriously injured, along with 12 recovered bodies, and set sail for the Shannon estuary. From here, the survivors and the bodies were flown on to Shannon Airport, where they were greeted by the appropriate medical and mortuary teams. It was this part of the rescue operation that young Michael Flahive witnessed. 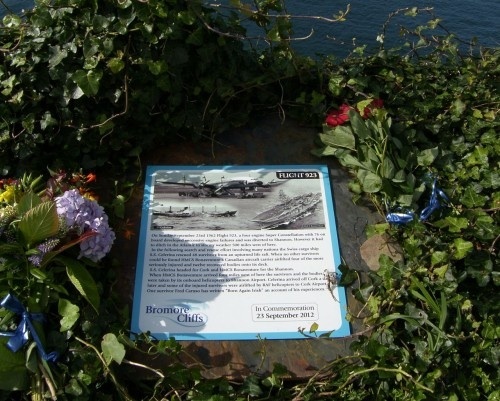 Today, a memorial plaque can be seen on the Bromore Cliffs, embedded in a pad of concrete and surrounded by ivy greenery. On the 23rd of September 2012, exactly 50 years after the tragic events surrounding Flight 923, a ceremony was held on the Atlantic coast to dedicate a memorial to those who perished, those who survived, and to all who participated or were otherwise involved in rescue operations surrounding the event. 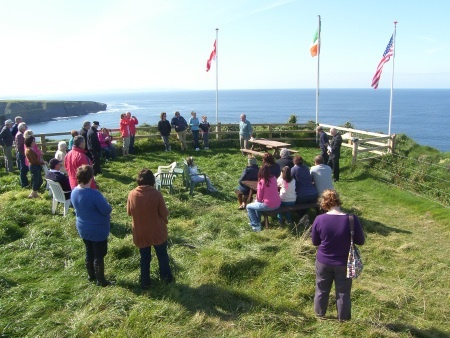 On the same day, a second and almost simultaneous memorial dedication to Flight 923's ditching and rescue was held on the Bromore Cliffs. Led by Michael Flahive, some 50 residents came together to reminisce on the event and the stir it created in their neighbourhood. This memorial acknowledged the importance of the role played by the crews of the HMCS Bonaventure, the S.S. Celernia, and all those who survived the fatal, unforgettable journey of Flight 923.